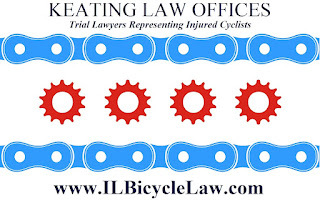 The Illinois Bicycle Attorneys at Keating Law Offices have filed a claim on January 11, 2013 on behalf of an injured bicyclist against the driver alleged to have struck him in Chicago's Albany Park neighborhood on April 21, 2011. As a result of the collision the bicyclist suffered severe injuries to his upper arm and shoulder which required three separate surgeries and months of physical therapy. According to the Chicago Police Department's report, the injured cyclist was riding eastbound on Montrose Avenue near its intersection with Troy Avenue when he was suddenly hit by a car. The driver had been traveling northbound on Troy when he came to the stop sign at the intersection with Montrose. Instead of properly stopping and yielding to the bicyclist, who had the right of way under Illinois law, the driver allegedly pulled out into the intersection without warning and struck the bicyclist. At the time of the collision, the driver was driving a company car used for deliveries. The bicyclist was immediately rushed by ambulance to a local hospital for treatment of his injuries. As a result of the collision the driver was issued two traffic citations by the Chicago Police Department including one for violating Section 9-40-160 of the Chicago Municipal Code. Section 9-40-160 requires all drivers to use "use due care to avoid colliding with any pedestrian, or any person operating a bicycle or other device propelled by human or animal power, upon any roadway..." Any driver who strikes a bicyclist in Chicago has clearly violated this local law. 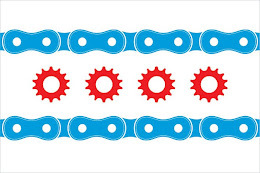 Despite Illinois state laws, and laws like 9-40-160 in Chicago, that expressly give bicyclists using roadways protections equal to those of motor vehicles, bicyclists continue to be viewed by many drivers as obstacles or annoyances rather than legal users of the road. Our firm has successfully represented many bicyclists who have been injured by motorists who fail to use the level of care and caution that the law requires of all users of our shared streets to exercise. If you have been injured while biking due to a careless or reckless driver, the experienced Illinois Bicycle Attorneys can help you seek justice whether or not the driver was issued a traffic ticket or citation. Please call us today to discuss your case and options if you have been injured by a car while riding your bike. 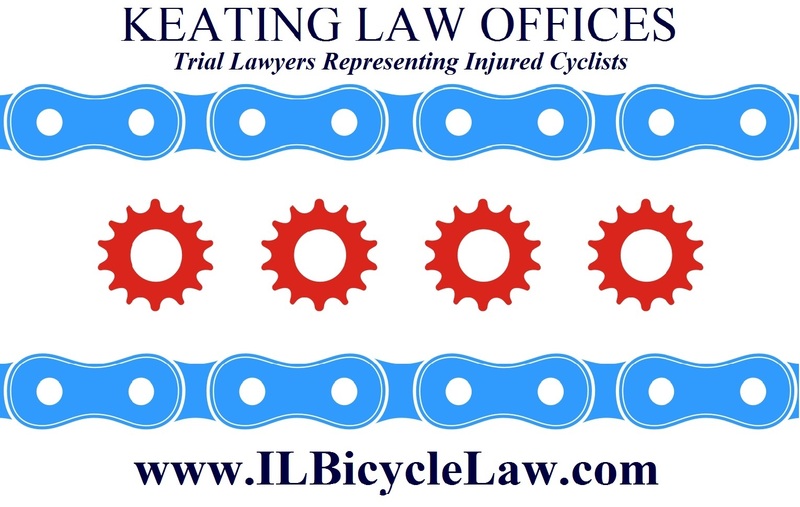 If you have any questions regarding this post or an issue involving Illinois personal injury law, Illinois Bicycle Attorney Mike Keating is available to help you 24 hours a day, 7 days a week. Please contact Mike anytime by calling 312-208-7702 or emailing him at MKeating@KeatingLegal.com. All emails and phone calls are returned promptly. All initial consultations are confidential and free. In addition to representing bicyclists, Keating Law Offices handles all types of personal injury cases throughout Illinois.